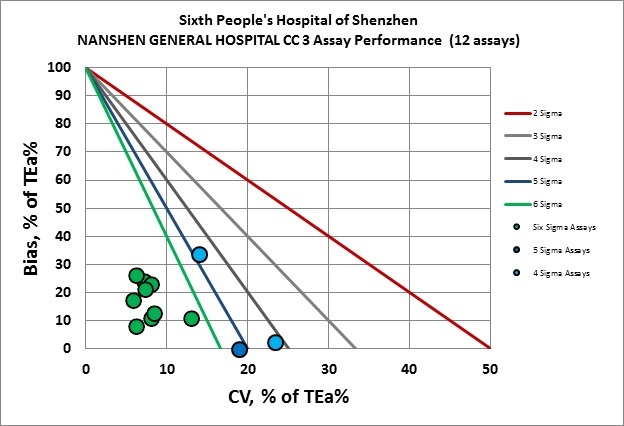 The Sixth People's Hospital of Shenzhen - also known as Shenzhen Nanshan District People's Hospital - becomes the largest Sigma Verification in China. 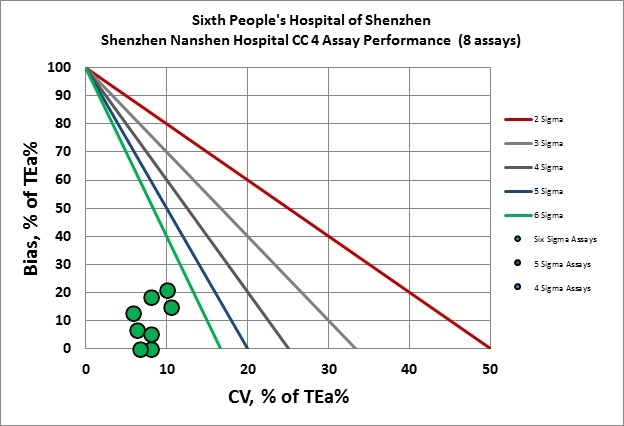 Seven different instruments and more than 50 different assays are verified, almost entirely Six Sigma quality. "Shenzhen Nanshan District People's Hospital, located in the west side of the beautiful Shenzhen Bay, is appraised as the fourth “First-Class Hospitals at Grade III” in Shenzhen as well as the regional medical center of Nanshan District. "The hospital was founded in 1946, and formerly known as "Baoan County Health Center", "People's Health Center of Baoan County", "Nantou Health Center", "Nantou Commune Health Center", "Nantou Area Health Center" and "Nantou District People's Hospital". In 1992, the hospital changed its present name to "Shenzhen Nanshan District People's Hospital", and then added the name" the Sixth People's Hospital of Shenzhen” in 2004. In September 2009, the collaboration with Wuhan Union Hospital created a brand new name "Huazhong University of Science and Technology Union Shenzhen Hospital". In December 2012, it became the non-subordinate clinical medical school of Guangdong Medical College. "At present, the hospital has 900 authorized beds and 1200 open beds to serve a population of 1.7 million in Shenzhen city. In next a few years, a new Outpatient & Emergency Medical Technology Building, a Surgical Building and a Scientific Research & Teaching building will be built under the government investment in the amount of 1.3 billion yuan. In the near future, the hospital will have 1300 authorized beds and covera total built-up area of 248,800 square meters..
"The hospital currently consists of 46 clinical departments, 18 medical technology departments, and has jurisdiction over 24 community health centers. Furthermore, there are 1 state key clinical discipline (Pain Department), 2 province key clinical disciplines (Infection Department, Rehabilitation Department), 1 municipal laboratory (Infection Department etc. ), 3 municipal key disciplines (Pain Department, Infection Department and Spine Surgery Department), and a plurality of district-level key disciplines and support disciplines. In 2013, the national primary trauma care training base was established. In 2014, there were more than 2.95 million out-patients visits (exclusive of medical examination), which included 10 million from community health centers, 19 million from headquarter, 48 thousand discharged and 13 thousand operations. "By the end of 2014, the hospital has 2165 staff and workers. and There are 113 medical staff warded doctoral degree, 255ones granted master degree and 401specialists with senior professional title. There are also 11 teaching and research sections in the hospital including Internal Medicine, Surgery, Gynecology, Pediatrics, Pain, TCM, General Surgery, Nursing, Rehabilitation, Dental, E.N.T. and Emergency&Critical Care Medicine. "In the past three years, the hospital has obtained 6 cases of the National Natural Science Foundation, 3 provincial research funds, 13 bureau-level research fund, 79 municipal research funds and 99 district-level research fund. In the meantime, the number of pubilshed papers with significant quality has been increasing steadily and, 42 of them were cited by SCI. "Following the spirit of sustained efforts and continuous improvement, Nanshan District People’s Hospital will keep enhancing its core competitiveness, adapting to the economic and social development of Shenzhen, and satisfying the requirements of people’s health. In the near future, the hospital will eventually develop into a higher level comprehensive medical center." 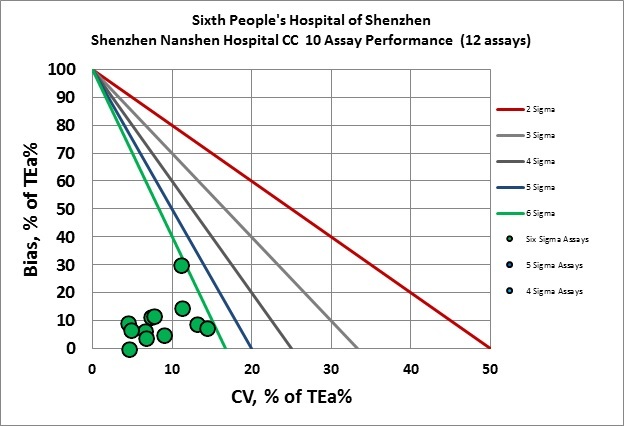 In addition to four clinical chemisty analyzers, with most performance at Six Sigma, Nanshan also verified three IA analyzers. 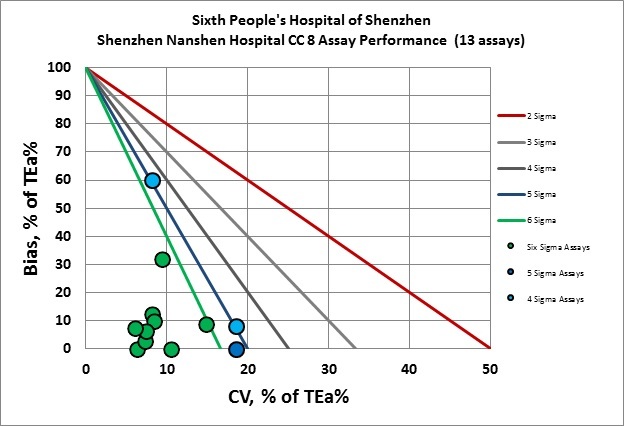 Congratulations to the entire laboratory at Nanshan General Hospital.